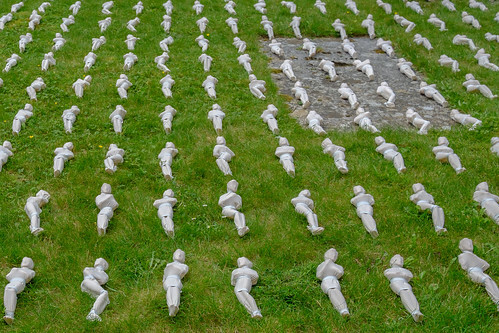 1,561 Shrouds of the Somme, one for each day of the First World War, are on display in the Cloister Garth in Salisbury Cathedral as part of a powerful piece of commemorative art marking the centenary of the end of the First World War in 2018. The enormous scale of the Shrouds of the Somme brings a genuine sense of the true cost of the conflict, whilst remembering those who gave their all as individual men. Artist Rob Heard is hand stitching and binding calico shrouds for 72,396 figures representing servicemen of the British Empire killed at the Somme who have no known grave, many of whose bodies were never recovered and whose names are engraved on the Thiepval Memorial. 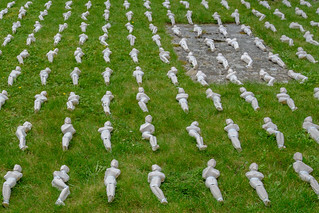 Each of the 12 inch figures in a hand-stitched shroud is linked to a fatality at the Somme using records from the Commonwealth War Graves Commission.